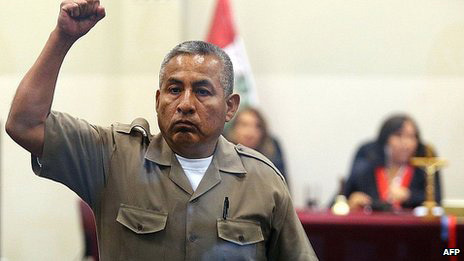 A court in Peru has sentenced the last of the original leaders of the Shining Path rebels to life in prison. 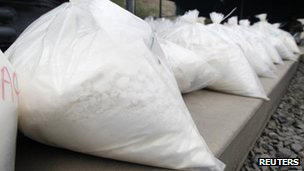 Judges in the Peruvian capital, Lima, found Florindo Flores, who's known as Comrade Artemio, guilty of terrorism, drug trafficking and money laundering. He was also ordered to pay a fine of $183m (£117m). After hours of sentencing, Judge Clotilde Cavero said: "It was proven that he (Artemio) ordered the execution of a number of civilians, police and soldiers. "It was proven that he belonged to the Central Committee of the Shining Path. "It was proven that he was the top leader in the (Alto) Huallaga (Valley)," she said. During the trial which lasted six months, Artemio, 51, had denied the terrorism charges but referred to himself as a "revolutionary". He admitted in December 2011 that the Shining Path had been defeated, and told reporters in his jungle hideout that the remaining rebels were ready to have talks with the government. But President Ollanta Humala has been adamant that his government will not "negotiate with terrorists". "They are cold-blooded killers, who kidnap children, don't respect basic rights, and try to use terror and extortion to change the democratic nature of the country," Mr Humala said last September. Inspired by Maoism, the Shining Path tried to lead a "People's War" to overthrow what they called "bourgeois democracy".